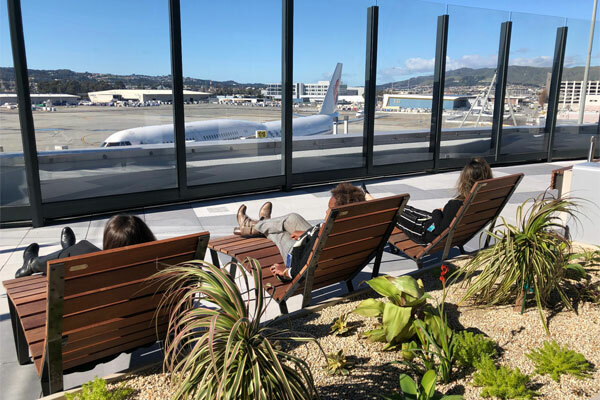 The San Francisco International Airport (SFO) has opened a unique new amenity to travellers – an outdoor terrace and observation deck, located post-security at the end of the International Terminal, Boarding Area G.
The open-air space affords 180-degree views of the airfield, including some of the largest aircraft serving SFO, such as the Boeing 747 and Airbus A380 aircraft. The 2,997-sq.-ft. terrace is furnished with wooden chairs, tables and chaise lounges, situated among a creative display of drought-tolerant landscaping. Three bronze sculptures by local artist Woody Othello are also on display. Ten-foot bird-safe glass panels provide wind protection while allowing open views of the skies above. The terrace will be open daily from 7 a.m. to 11:30 p.m.